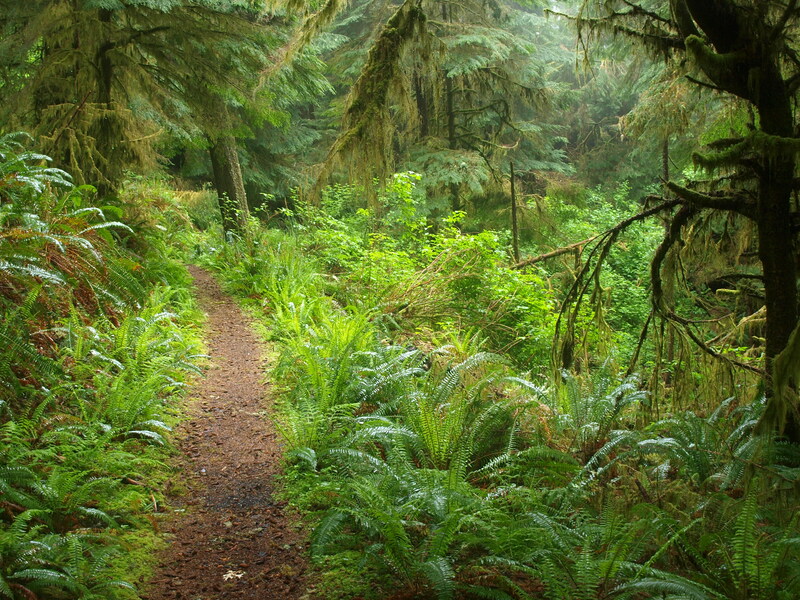 We were now off to the Cape Perpetua Scenic Area. This made me do an internal happy dance as there was a decent chance that I would get to go hiking. The weather was foggy and occasionally spitting, but I find those to be prime hiking conditions. The official plan was to drive to the top of the Cape for some photo ops and a bit of trail exploration. We did that and then I convinced the rest of the group to let me do some more hiking and meet up with them at a designated spot. This was one of my favorite moments from the trip. Not just because I’m the “Hiking Guy”, but because the trail and the elements were just so damn incredible. It really was a surreal walk through the woods and the mist. Recharged and inspired I hopped back in the van and we continued down the coast to the Sea Lion Caves. 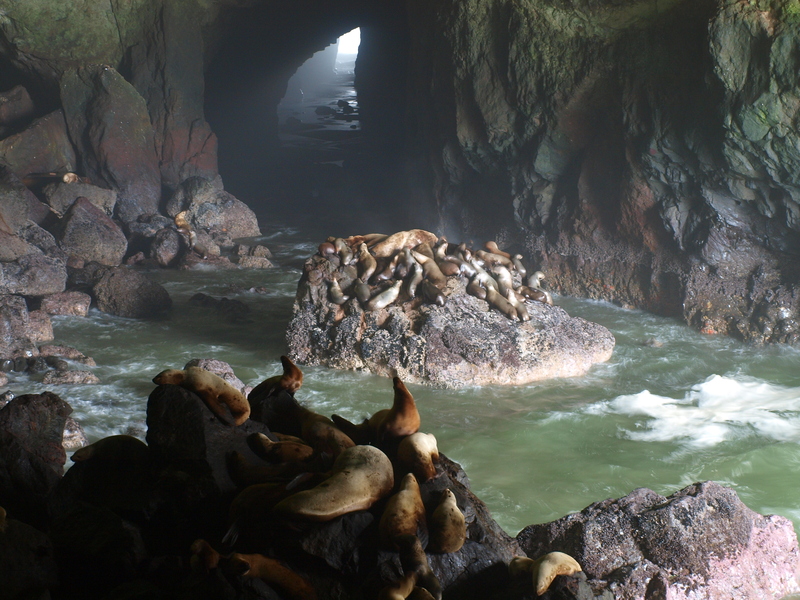 If you haven’t heard of the Sea Lion Caves I’ll go ahead and save you some research time. If you’re passing through Florence, you stop at the Caves. It’s the world’s largest sea cave for crying out loud. It’s a no-brainer. The life-loving Mr. Boomer Wright, General Manager of the Sea Lion Caves, gave us a first rate tour of the facility. The cave itself is as high as a 12 story building and as long as a football field. We took the elevator down to the official cave entrance where as luck would have it, there were a bunch of sea lions strewn across the rocks of the cave. Sure there are interpretive displays and a nice gift shop, and even some viewing areas above ground. But watching sea lions be sea lions in a giant cave is really all I need. It’s just cool. It was now time for lunch, thankfully. Because hiking and watching sea lions loaf on rocks will work up an appetite. We made our way into Old Town Florence for lunch at 1285 Restobar where we enjoyed some wonderful appetizers, artisan pizza, and conversation. Now it was time to watch other people exercise. We visited Sand Master Park where we met owner and sandboarding innovator, Lon Beale. 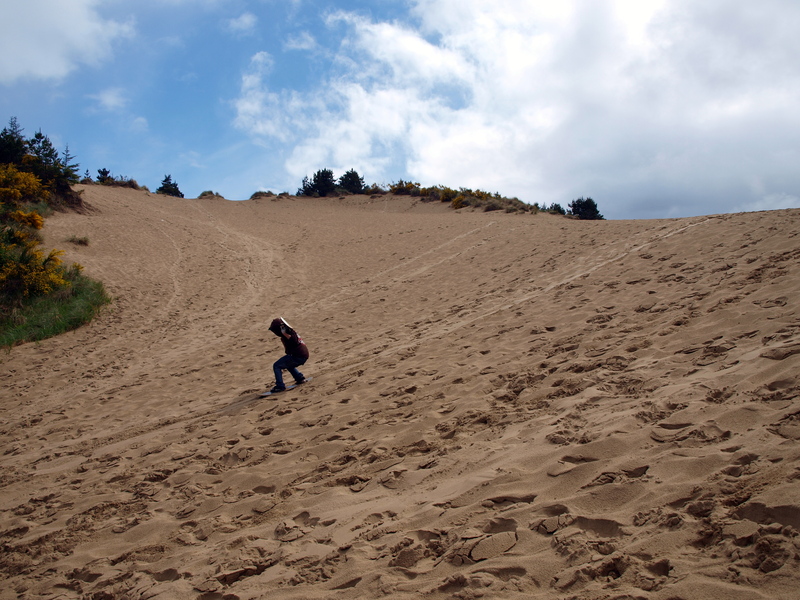 Now if you don’t live near sand dunes, well even if you do, there’s a chance you’re not all that familiar with the sport of sandboarding. Smirk if you like, but we mock what we do not understand. It turns out that sandboarding is in fact a relatively low cost, safe, and fun activity for just about anyone in the family. We were there on a day that had been raining off and on. But as is the case with most sports, you have specialized equipment for varying conditions. Sandboarding is no exception. The young and talented Joey Peterson came in to give us a demonstration of sandboarding on a board designed for wet sand. No kidding. We all traveled out to an agreeable looking sand dune and watched Joey do what he does. This is another one of those activities that I’m definitely bringing my daughter back with me to try out. We went from Sand Master Park over to meet with the fine folks at ApexHeli. If you couldn’t gather from the name, ApexHeli offers helicopter rides. Yep, this was shaping up to be an eventful afternoon. Apex Helicopters offers a wide range of services and tours – North Coast, South Coast, Sunset, custom, etc. We took what was essentially a custom 15 minute helicopter tour of the dunes and the city of Florence. 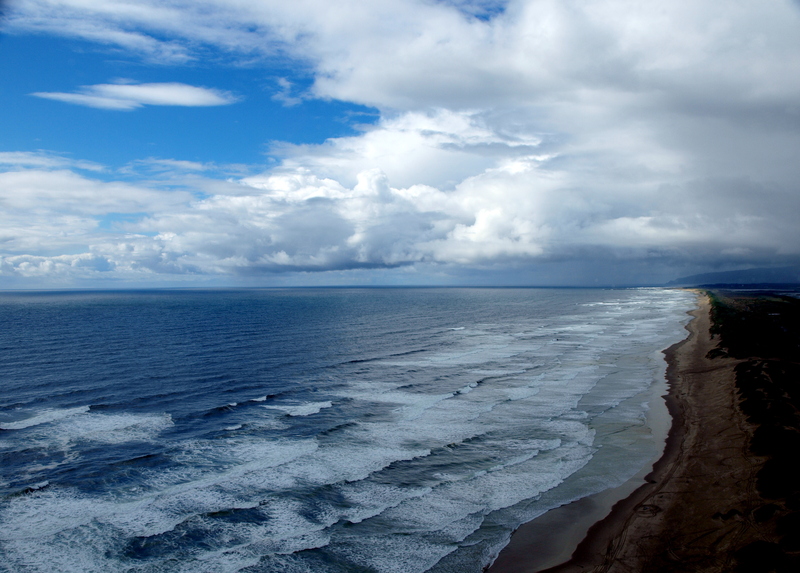 That might not sound like a long time, but 15 minutes in a helicopter over the Oregon Coast is a lot of living. This was my first time in a helicopter and I have to admit to some pre-flight butterflies. Once we were in the air for about 30 seconds, however, all the jitters turned to elation and school girl-like squeals of delight. Look at that picture and tell me you wouldn’t squeal too. High on life and adrenaline, it was time to check into our quarters for the evening. We stayed at the Best Western Plus Pier Point Inn, which offered evening-making views of the Florence bay front and the Siuslaw River. And also cookies! We freshened up/napped and then loaded into the van and drove back across the river for dinner at Spice. This was certainly one of the epicurean highlights of the trip. We sipped on a variety of specialty cocktails, nibbled on an array of mouthwatering appetizers, dined on inspired entrees, and savored every morsel of house made desserts. Many thanks and compliments go to Executive Chef and Manager, Kathy Costalanga. Now I was buzzing from everything: hiking, sandboarding, helicopter flying, eating, and imbibing. It was now time to go to my room, watch a sunset, drink a glass (or two) of wine and sleep. Check out the next morning was at 8:45am. If you’re not paying close attention, it’s easy to walk right past one of the best bars in North Portland. 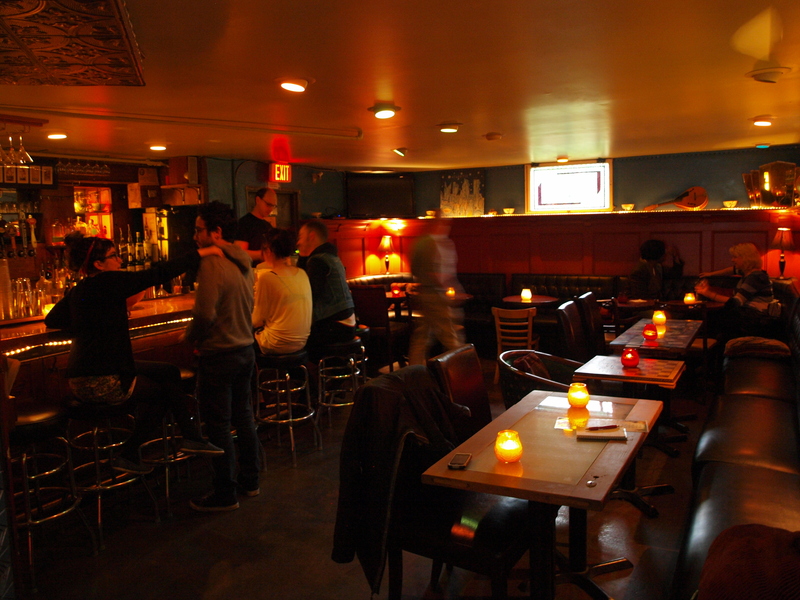 The space occupied by Sidecar 11 is no wider than the entrance to a prohibition-era speakeasy. 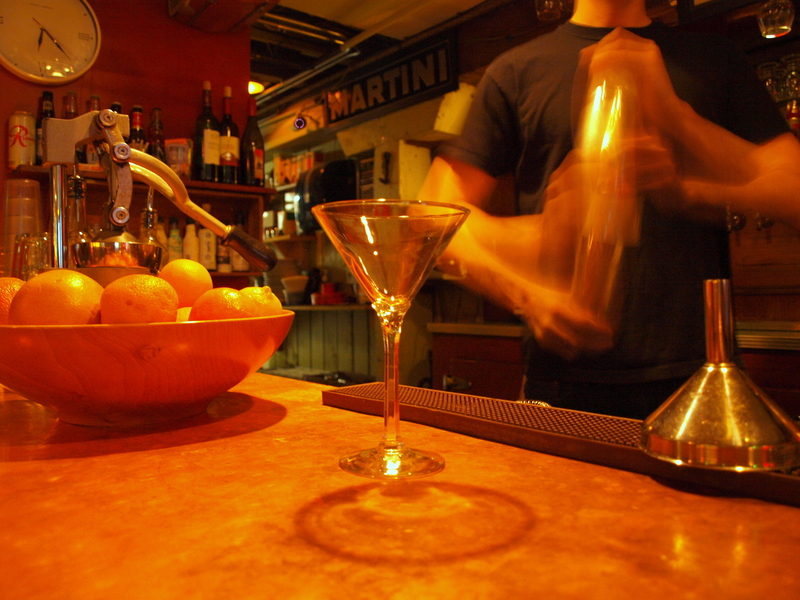 Like their drinks, however, the space is deep, sophisticated, and well thought out. I met Sidecar 11 owner, John Cooper, and bartender, Erin, a couple of weeks ago for drinks and a set of appetizers. Admittedly, I had been to Sidecar 11 several times before this visit. Not just because their drinks are top notch, but also because their happy hour food menu is delicious and inexpensive. What I hadn’t realized prior to this visit though, was the fact that John doesn’t have a kitchen. He has a refrigerator, a small area for dry goods, and a convection oven down at the far end of the bar. But instead of viewing this as a hindrance, John saw the unconventional setup as an open invitation to get creative. And while he did his thing at one end of the bar, Erin was doing hers at the other. The first drink that Erin produced was the Mississippi Sidecar. This interpretation of the old standard contains brandy, orange liqueur, and lemon, served up with a sugar rim. I should mention that Erin created the drink menu at Sidecar 11. A fact that might explain why she produced each of my drinks with the care and attention to detail that a mother might lavish upon her children on the first day of school. Think I’m exaggerating? Order any of her original menu drinks and tell me I’m wrong. It was also around this time that John brought out the first appetizer, a Tapenade Plate that features basil pesto, roasted red pepper, garlic and olive tapenade, and crostini. This was delicious as expected, but the next plate John presented was outstanding. Look at that! That right there is a combination of the Garlic Steak Skewers and the Marinated Chicken Skewers. The steak skewers are baked medium with green bell pepper and served with spicy peanut sauce & green onions. 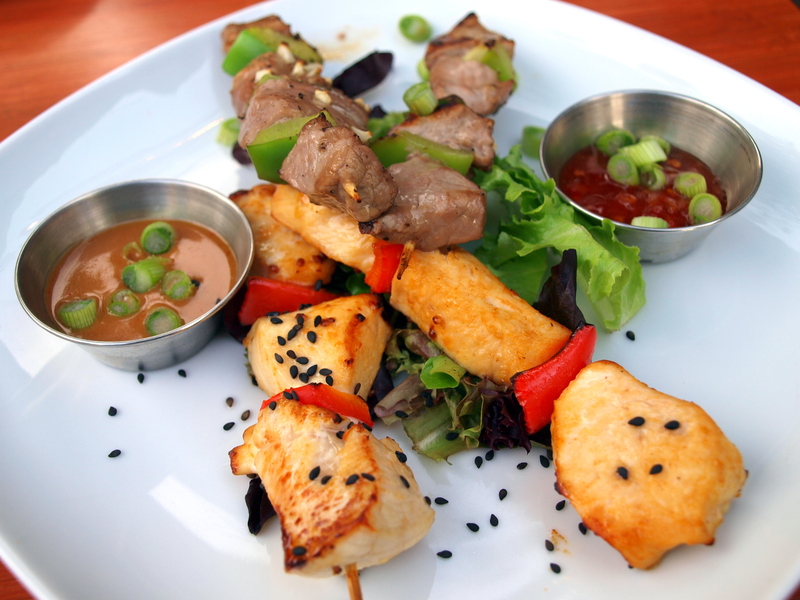 The chicken skewers are baked with red bell pepper and served with sweet chili dressing & black sesam e seeds. Incredibly well cooked, flavored, and presented, John nailed it with that skewer plate. Next up drink-wise was the 20 Fountains. Named for Portland’s famed Benson Bubblers, this concoction has Bulleit Rye, Carpano Antica, Peychaud’s Bitters, and Regan’s #6 Orange Bitters. Classy, right? Simon Benson may have been a teetotaler, but I bet he would have stolen a sip or two of this fine beverage when no one was looking. John then decided he wanted me to love him forever. He gave me a new potential menu item he had been working on, which was more or less the Sidecar 11 version of a Chile Relleno. A roasted Anaheim chili stuffed with prosciutto, mozzarella, cheddar, provolone, bread crumbs, and caramelized onion. Roasted Anaheim chilies are somewhere in the top 5 of my favorite things on this planet. Needless to say this offering made me giddy as a school girl. Not to be outdone, Erin whipped up two cold weather drinks that were originally created by some of John’s old bartender friends. The Nana’s Nip, which has ginger juice, lemon juice, Laird’s Apple Jack, and hot water, was sweet and flavorful. And the last drink of the evening, the Oh Fidel, You Cad!, was as delicious and gut-warming as its name is creative and giggle-worthy. Comprised of a healthy dose of rum, Falernum, lemon juice, and hot water, the Oh Fidel was the perfect capper for the evening. Sidecar 11 was a great way to finish off the “research” I’m doing for the upcoming Happy Hour piece in NorthWest Travel Magazine. I want to thank John and Erin for being fantastic hosts. It was a real pleasure to get a thorough sampling of what was already one of my favorite bars. I win! Housed in what used to be a Baptist church, Mississippi Studios is one of the premier music venues in Portland. Long known for its choice acoustics and knack for booking similarly thought of music acts, Mississippi Studios has also managed to garner some renown for its drinkery, Bar Bar. Like an alcohol slinging conjoined twin, Bar Bar sits connected at the hip next to Mississippi Studios. As you might expect, the musical influence spills over from next door. 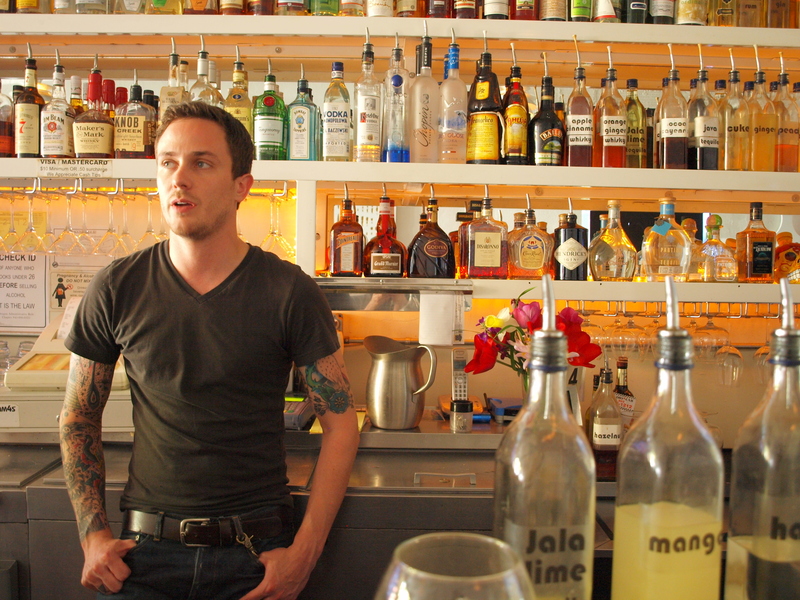 The staff at Bar Bar is a tight-knit bunch with close ties to the local music scene. As a drinking spot, Bar Bar features a couple of its own headliners. 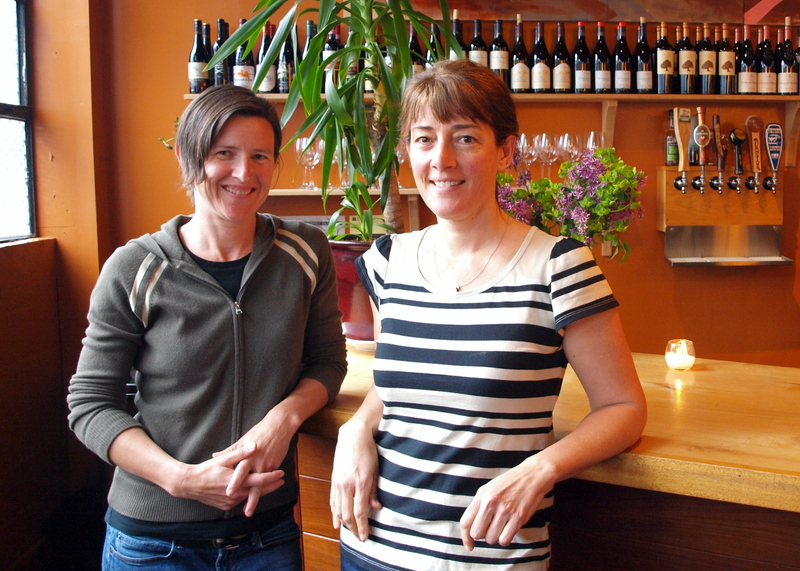 For starters, their burgers are easily some of the tastiest in North Portland. 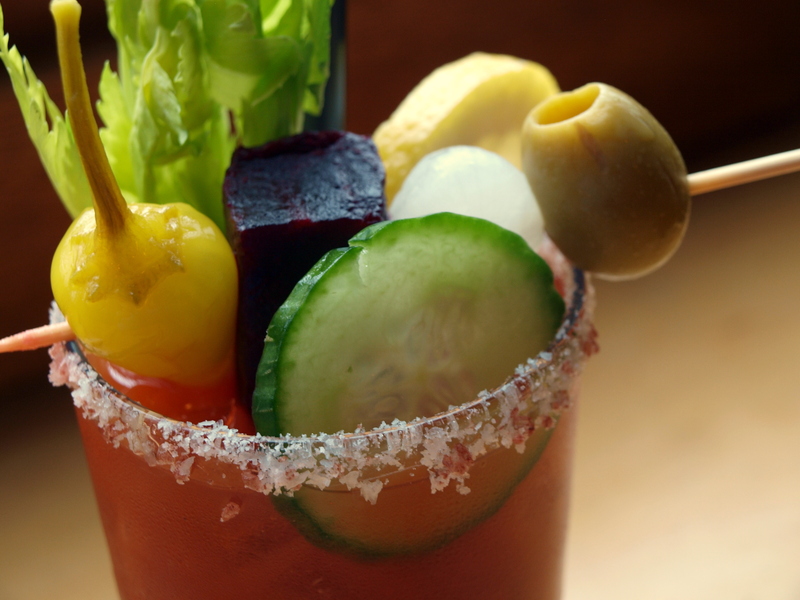 And if that weren’t enough, you can take that burger and a stiff drink out onto one of the finest, most expansive patios this side of the Willamette. If you live in Portland, you know that outdoor seating means almost nothing for 9 months of the year, but for the other three it means almost everything. Bar Bar’s patio is epic. Burgers and patios are great. They’ll perhaps get you through the door, but you’re not staying unless the drinks are up to snuff. A couple of weeks ago Kassidy and I made our way down to Bar Bar where we were met by Publicity Coordinator, Stephanie, and Tender of Bar, Arian. Both ladies were very easy to talk to, and I hope they don’t mind my saying, rather easy on the eyes as well. I’ll admit I don’t tire of attractive barkeeps. While Kass and I chatted up Stephanie, Arian went about the business of assembling a series of memorable/memory erasing bevies. Among them was the Upside Down Margarita. Featuring one of the agave plant’s gifts to humanity, el Jimador Tequila Reposado, and a bounty of muddled citrus, this drink was a tall delicious glass of get you there. Another star was the Basil Sweetness. Comprised of basil, grape, ginger ale, and 42 Below vodka, this was one of my favorite drinks of the last month. There was nothing overly cute or fancy about it, just a fine drink that’s definitely more than the sum of its parts. And since all this “research” was for the fall edition of Northwest Travel Magazine, Arian finished us off with a Hot Toddy. Orange juice, whiskey, honey, and hot water garnished with a cinnamon stick and an orange wedge. Kassidy is by no means a whiskey gal, but she tried to bogart this particular toddy, which tells you something about it. Many thanks to the fine staff at Bar Bar; in particular, Stephanie and Arian. If I ever tire of really good drinks and conversation, I’ll stop coming. 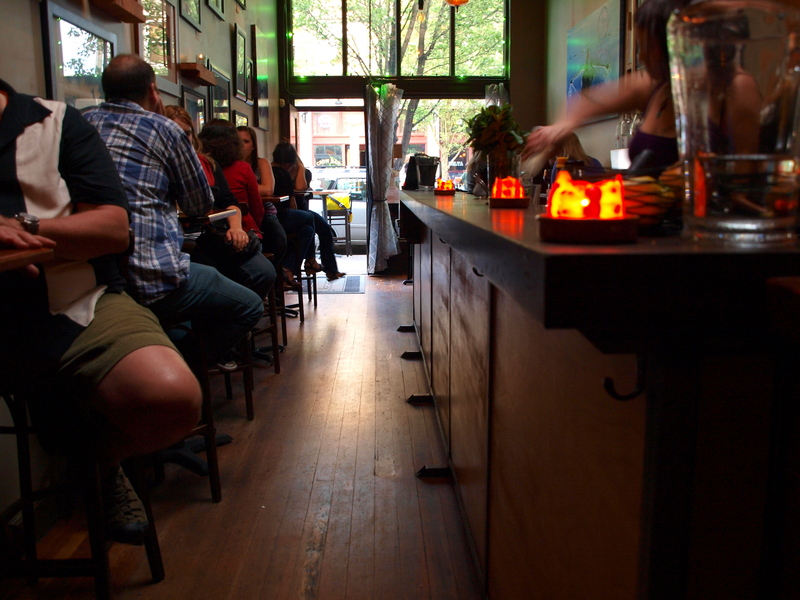 In Portland, it’s not unusual for a bar to exist as an attachment to a larger business. It’s one of the things I love about the area. 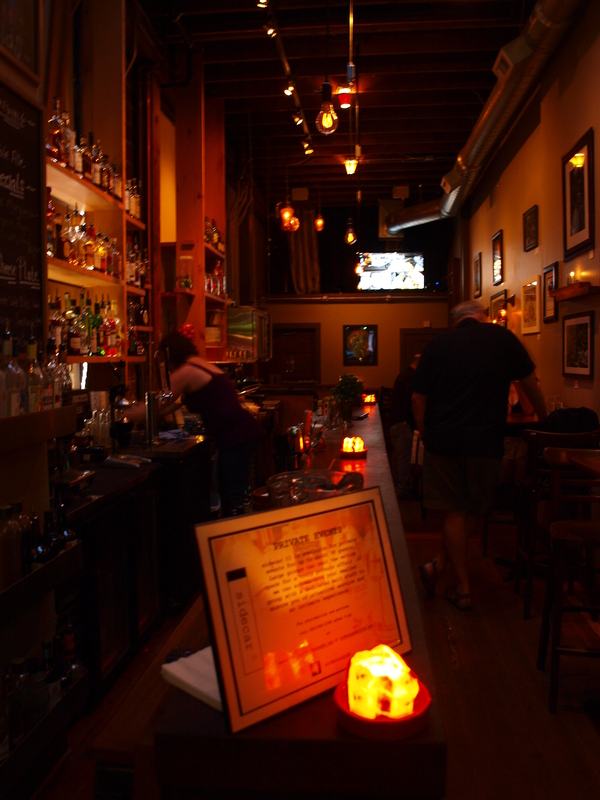 Chinese restaurants, mom-and-pop diners, music venues; you’re never far from a stiff drink in Portland. While in some cases these drinking establishments might seem to exist as an afterthought, they occasionally develop into the primary reason you decide to leave the house. 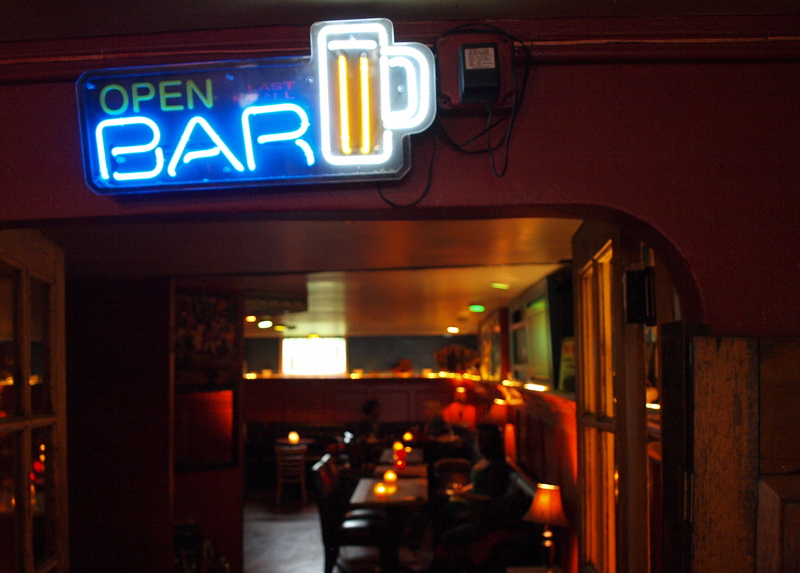 These bars tend to be low-lit, intimate, and hidden in the back. Quite often, they play host to a stable of staunchly loyal patrons that are more than ready to pull the needle off the record player the second a new face accidentally stumbles through the door. These are the places I love to hang out in, but only when the regulars are more inviting. The Atlantis Lounge inside Mississippi Pizza is one such place. Back in the late 90’s owners Philip and Stephanie Stanton were one of the first entrepreneurs to take a chance on the then struggling neighborhood. Today, Mississippi Pizza thrives as a community hub for food and entertainment. The pizzeria caters to singles, couples and families. They host live music, bingo, trivia nights (Quizissippi), and even the occasional spelling bee. I’ve attended all of these functions at least once, and they’re great. But our attention on this particular evening was on drinks; and more specifically, the Atlantis Lounge. Tucked neatly into the rear of Mississippi Pizza is the nautically themed Atlantis Lounge. It possesses all the character and ambiance you want from a hole-in-the wall dive hidden in some inner-city alley. It also comes with the coziness and safety that you might expect from, well, a pizzeria on Mississippi Avenue. We were met by the owner of Mississippi Pizza, Philip, bar manager, Nikki, and tender of bar, Adam. The Atlantis Lounge emphasizes fresh squeezed fruit juices. We were served up a sampling of drinks that uphold that ethos well. The first of these was the Atlantis Margarita. Sauza blanco tequila, GranGala, lime, fresh orange, and prickly pear, served on the rocks. The drink was fresh, stiff, and crisply sweet. Next was the Titanic. 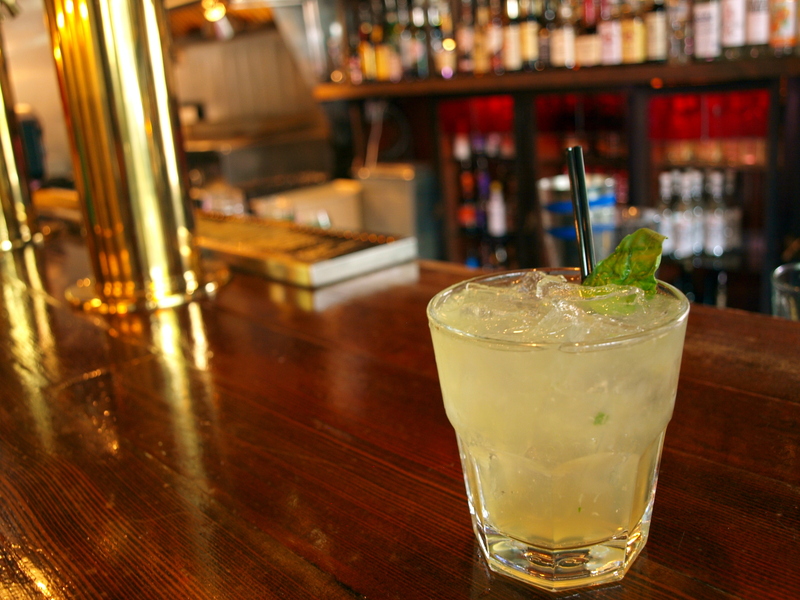 Comprised of Monopolowa vodka, triple sec, lime, and fresh squeezed grapefruit, served up. If you like a good Greyhound you already know that grapefruit juice and vodka are two great tastes that taste great together. This drink is no exception. The lime and triple sec round out the citrus flavor of the grapefruit solidly. Next up was the Noble Pear. 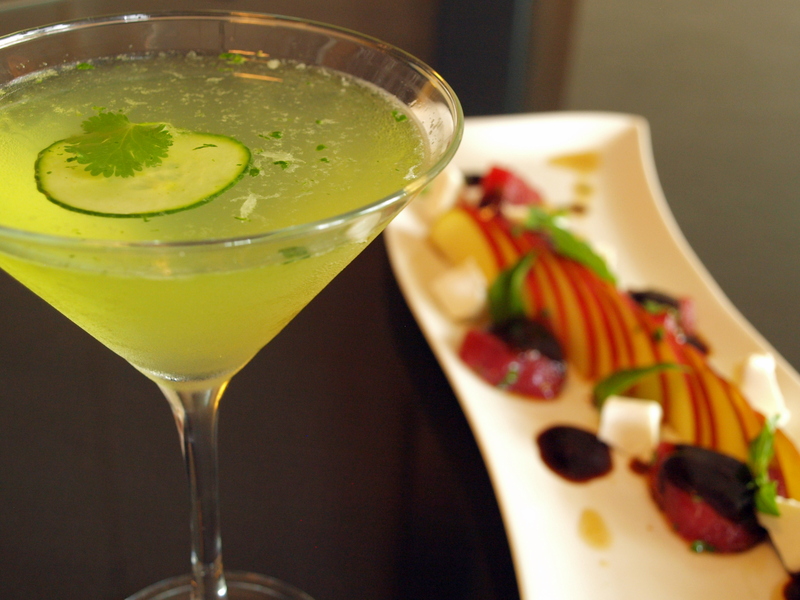 This drink features local Clear Creek pear brandy, GranGala, and lime; shaken and served up, with a sugared rim. Perhaps it’s just my locavore tendencies, but I love me some Clear Creek brandy and this drink utilizes it perfectly. The pear brandy remains the standout, being ever so slightly complimented by the GranGala and lime. 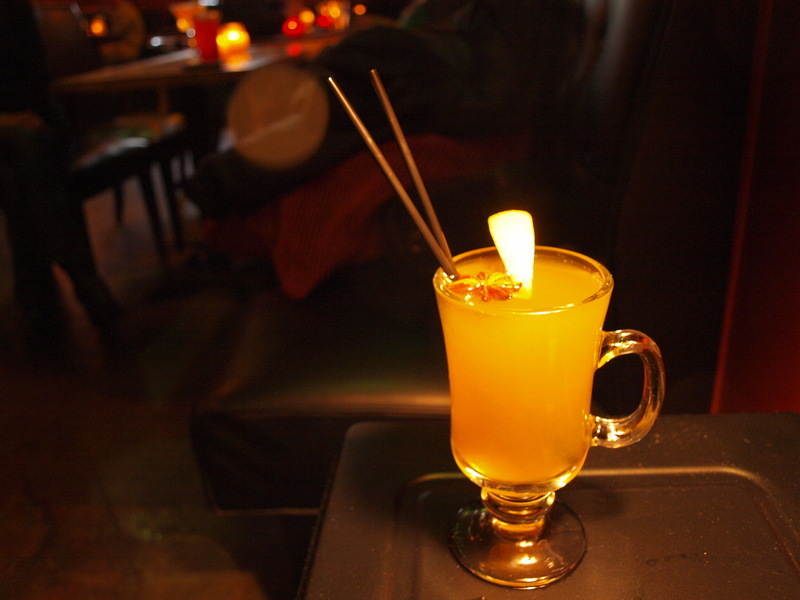 We finished with a nice cold-weather beverage, the Merman’s Hot Toddy. 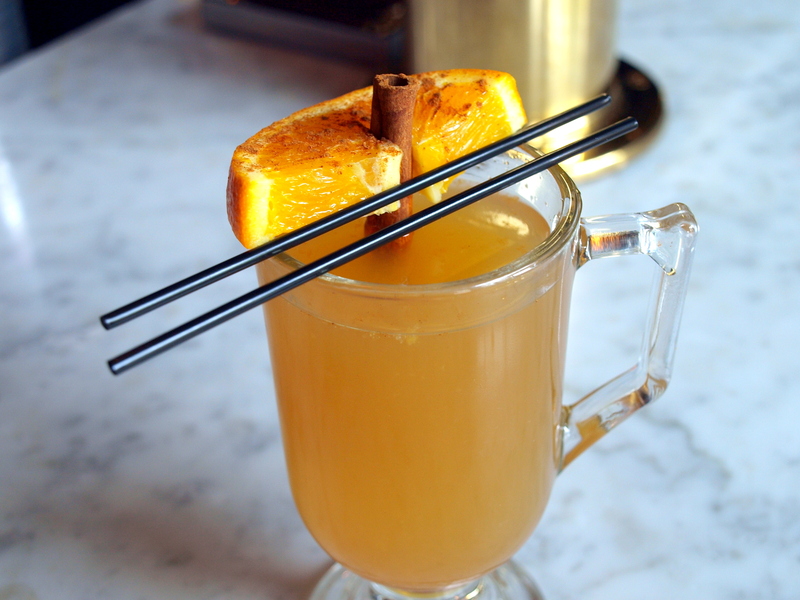 This straight forward warmer utilizes Maker’s Mark and lemon in a ginger toddy. The glory of the toddy is that warm tummy sensation. If it’s done right, you’ll question how much of that warmth is produced by the temperature of the beverage and how much is produced by alcohol content. Adam nailed that balance. Always put your faith in guys named Adam. Massive thanks to Philip, Nikki, and Adam for providing us with wonderful drinks and conversation. I look forward to slipping into and enjoying every cozy nook the Atlantis Lounge has to offer. Samurai Blue is new. Not toddler new, infant new. At just about six months old, the place hasn’t been on Mississippi Avenue any longer than I’ve had my current bottle of ketchup. But clearly, owners Tommy and James didn’t need much time to get their legs underneath them. 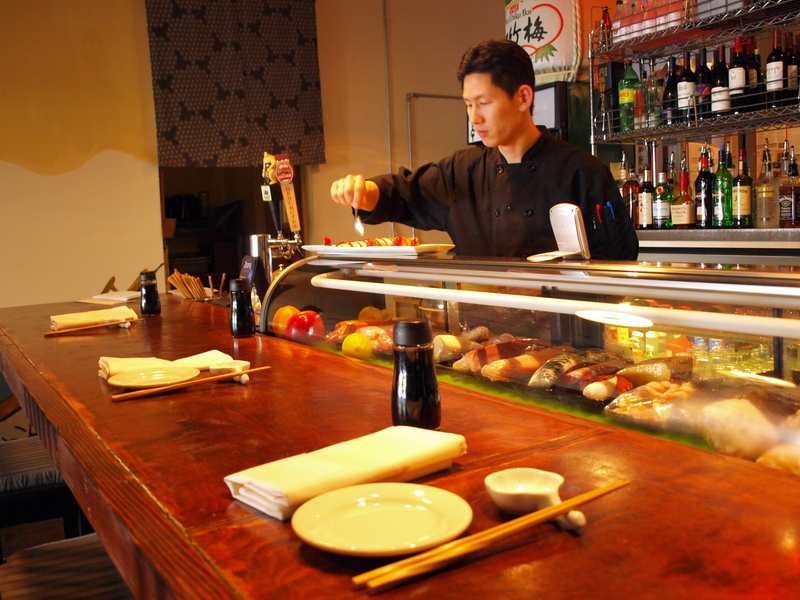 Serving contemporary Japanese cuisine, Samurai Blue has already garnered a reputation for having some of the best sushi in Portland. The dining area at Samurai Blue is subtle and clean. It’s a comfortable space that’s as suitable for casual lunches as it is for date night. But on this particular day, Kassidy and I were there for drinks. 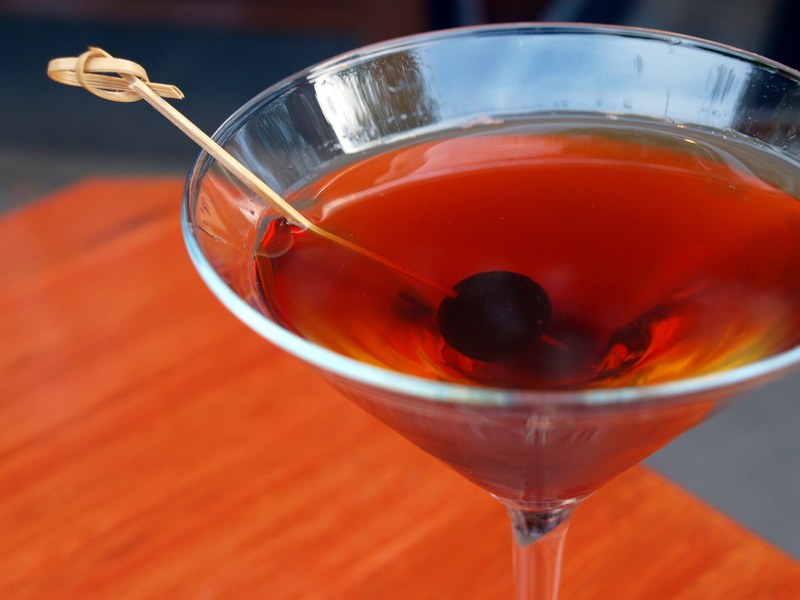 The drinks at Samurai Blue shouldn’t fly under anybody’s radar. They’re good. Lead bartender, Zachariah, has produced a menu of creative, Asian inspired mixed drinks that are as tasty as they are potent. House infused liquors and fresh ingredients are the focus. Zachariah was cordial, quiet, and self-effacing, but don’t let that fool you. 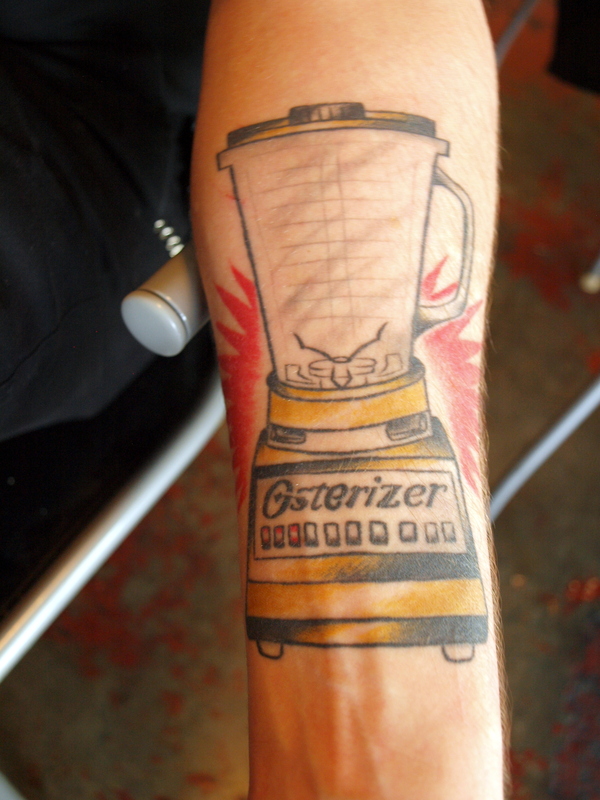 Anybody that has a tattoo of an Osterizer blender on their forearm is probably serious about their drink-makery. Zach started us off with a Cucumber Martini comprised of house infused cucumber vodka, cilantro, lemon, and a few drops of Tabasco. By the way, the Tabasco gave it a nice back end without making the drink spicy. It was also about this time that Tommy produced the Tuna with Goat Cheese plate. The two primary ingredients are plated with sesame oil, sun dried tomato, balsamic vinegar, basil, Fuji apples, and honey. 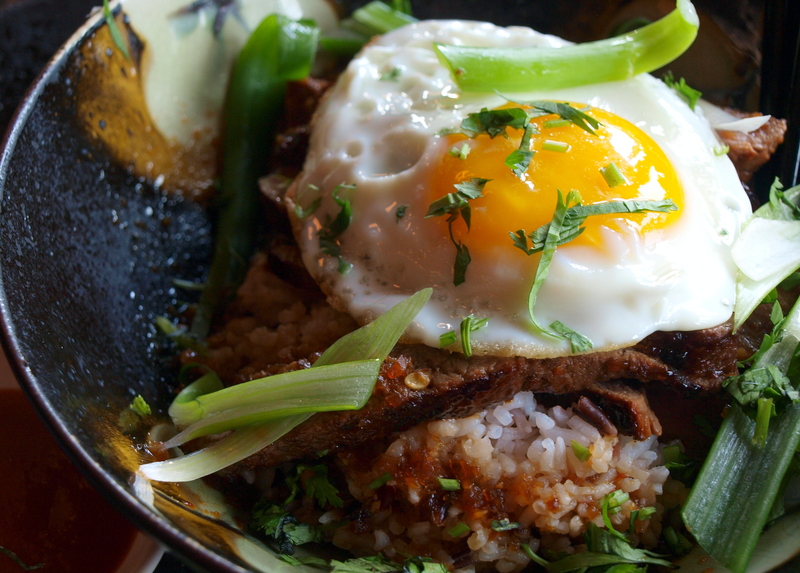 It was as delicious as it sounds; savory, sweet, and satisfying without being filling. I would later be very happy we had it. Next we had a Ginger Mojito made of house infused ginger-rum, mint, sugar, lime, and soda. One more time, house infused ginger-rum. Put it on your Christmas list. We were then we were given a Black Belt. The drink features house infused blackberry vodka, house made blackberry syrup, cranberry juice, and rice milk. This drink was sweet, fresh, and a prime example of Zach’s willingness to experiment. Then Zach brought in the closer, the Samurai Tai. This fancy number had rum, house made grenadine, orange liqueur, fresh lemon, fresh lime, and pineapple. In typical fruity drink fashion, it tasted like god’s fruit punch. It would also render your limbs useless and make you forget you had children if you drank more than two. Thanks to Tommy, James, and Zachariah for their time, and for providing us with outstanding food and drink. I need to pitch a story idea about sushi to somebody. Before the construction of Interstate 5, Mississippi Avenue was the heart of Portland’s African-American community. Once the neighborhood’s backyards and porches were replaced with a freeway, however, the area began a multi-decade slide into crime and financial hardship. Thanks to forward-thinking city planning, long-time neighborhood residents, and astute business owners, North Mississippi Avenue began its journey on the road to recovery in the late 1990’s. 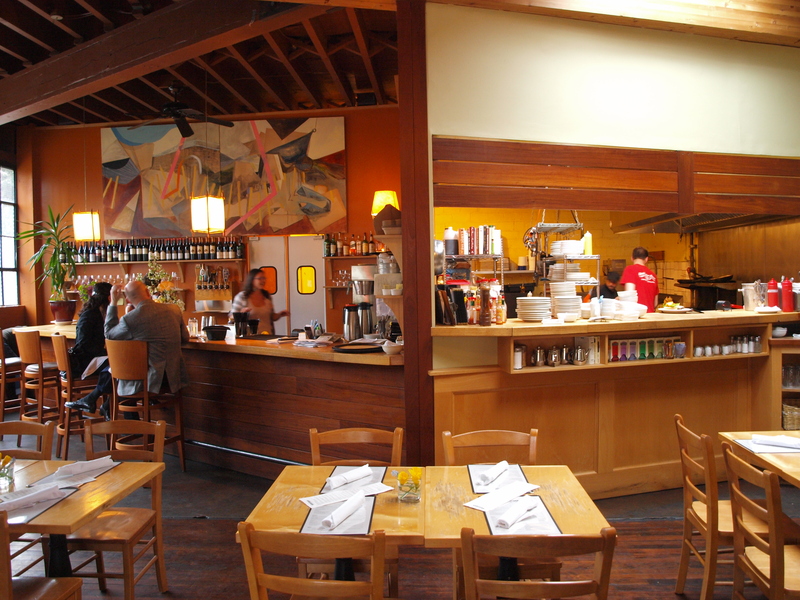 Now, after a steady influx of one-of-a-kind shops, eateries, and businesses, the area is one of Portland’s destination neighborhoods. It is diverse, eclectic, and inclusive. A bar patron I met one evening described the transition to me as a refreshing revitalization and not a gentrification; an important distinction for locals. The Equinox Restaurant and Bar mirrors the soul and the spirit of the Mississippi movement. One of the original businesses to establish roots during the revitalization, Equinox is intent on handling every aspect of the business with the community’s needs in mind. The building was furnished with materials from another community cornerstone, the Rebuilding Center. It is not uncommon for the owners of Equinox, Michele Stultz and Tara George, to borrow supplies from other Avenue businesses when they run out, and vice versa. It’s also not all that rare for folks in need, to work the occasional odd job at Equinox in exchange for food or money. Being rich with community-minded good intentions does not, however, assure you a thriving business. That’s where good food and drink come in. And on this particular sojourn into the neighborhood, it was all about the drink. My friend (and assistant for the day) Kassidy and I where met by owners Tara and Michele, who were kind enough to answer a quick set of questions before heading behind the bar themselves to assemble a series of drinks. A gorgeous set of drinks I might add. First out was an Applewood Smoked Vodka Bloody Mary that was so chock full o’ delicious that every Bloody Mary over the next 2 months will be bitterly disappointing. Next was a perfect warm weather drink, the Garden of Eden. 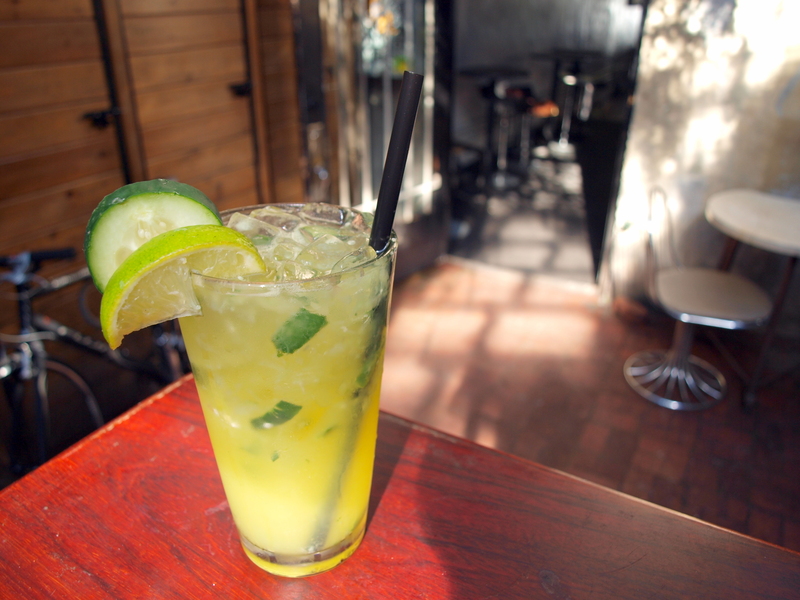 This little number had vodka, muddled basil, cucumber and limes, and simple syrup with a sugar rim and cucumber garnish. To balance that out, our next beverage was the EQ Café Espanol. What their Bloody Mary did to me, their Spanish Coffee did to Kassidy. 151 rum, Stumptown Coffee liqueur, Cointreau, coriander tincture, coffee, and whipped cream. 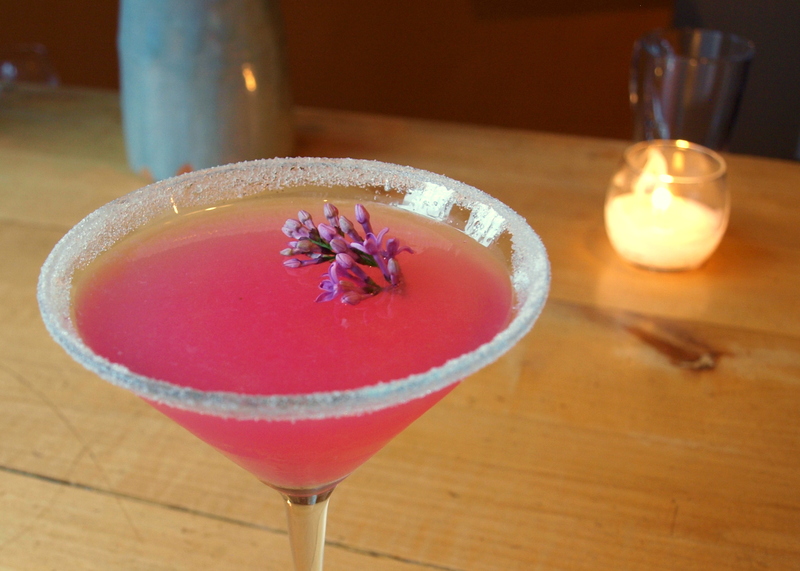 To finish everything off, Michele whipped up an off the menu gem that was essentially a Lemon Drop Martini made with lilac simple syrup, and garnished with lilac trimmings from the garden. And just to make sure we didn’t leave on an empty stomach they provided us with a plate of crispy wontons stuffed with mushrooms, Danish bleu cheese, and chives, served with a sweet chile-lemon dip; their Wild Mushroom Bites. Big thanks to Michele, Tara, and the attentive and patient staff of Equinox. Kassidy and I have plans to attend brunch there this month so we can try out the food (and another Bloody Mary or three). I read somewhere that photography and alcohol don’t mix. That may be true, but I think writing and drinking pair off nicely. 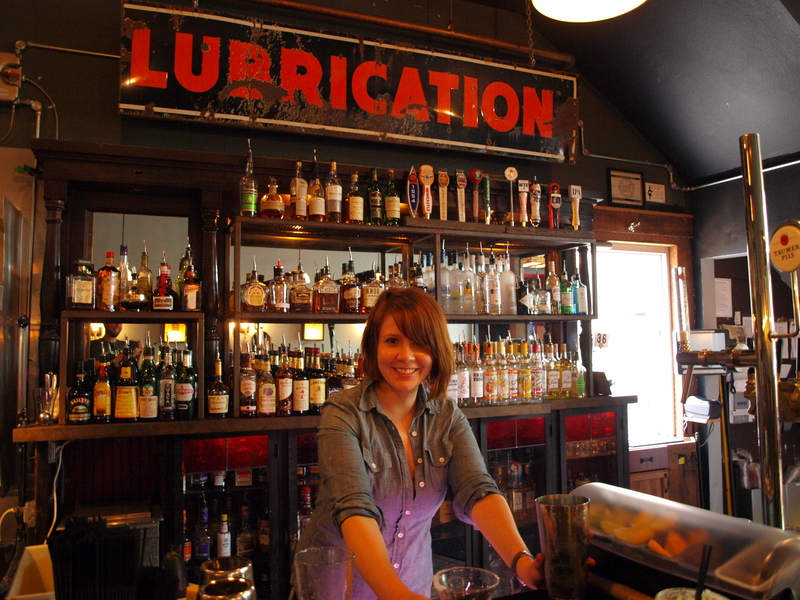 I was recently given an assignment from Northwest Travel Magazine to cover the happy hour scene on Mississippi Avenue. By the way, that’s a story idea I pitched to them. If you know me at all that shouldn’t be much of a surprise. Since I sincerely believe that in-depth research and subject immersion are the keys to insightful writing, I have taken it upon myself to visit as many of the bars along Mississippi Avenue that will have me. This coalition of the willing includes newer places, older places, upper end hot spots, and borderline dive bars. Last night I had the privilege of visiting moloko. Going on 6 years old, moloko is owned and operated by Christian Fitzpatrick. What he’s created is a comfortably eclectic place to hang out. It’s modern, it’s vintage, it’s soul and hip hop. 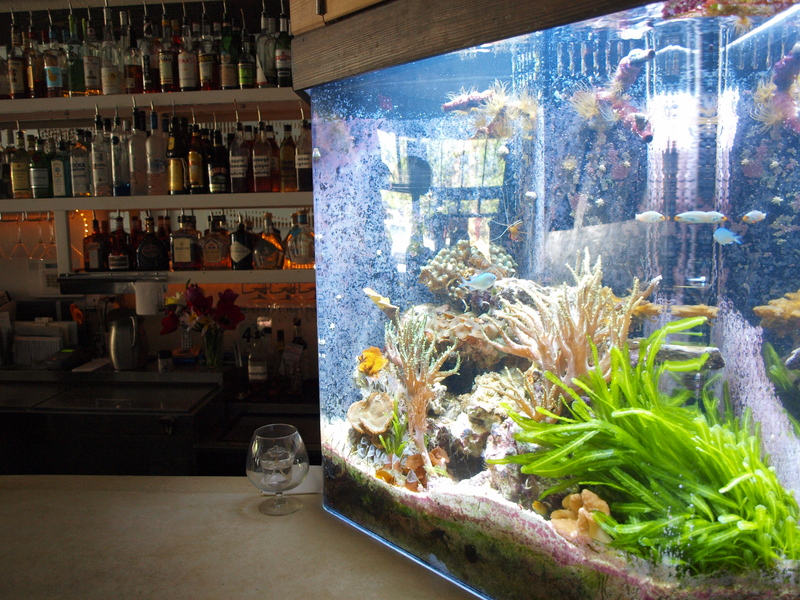 It is also mesmerizing fish tanks. It’s where George Jetson and Common might meet up for a drink; and then be joined by a handful of regulars. My mixologist for the evening was James. Despite the burden of being distractingly good looking, James was able to pour a series of creative and spot-on drinks. In addition to all the standards, Moloko has a lineup of house infused liquors. I started off with a couple of summer inspired cocktails. The Smoldering Fruit Bomb was comprised of habenero infused vodka, fresh squeezed orange and lime juice, pineapple juice, agave and soda. It was equal parts “hello there” hot and fruit juice sweet that made the beverage remarkably refreshing. In terms of refreshment though, you’d be hard-pressed to top the Aaah Jamye. My second drink of the evening was made with muddled cucumber, jalapeno-lime infused tequila, fresh squeezed lime and orange juice, agave, and soda. Good luck finding a better warm weather drink than that. Perhaps the only downside is that the drink goes down way too easy. I suppose depending on where you stand (or wobble), that’s not a downside at all. Since the article I’m writing might be featured in the winter edition of the magazine, James finished things off with the Gingerly. The drink has orange-ginger infused whiskey, fresh squeezed orange and lemon juice, honey, nutmeg, cinnamon, and hot water. It’s garnished with a cinnamon stick and a clove stuffed orange slice. Man oh man if this thing didn’t have me briefly pining for colder weather. Briefly. Big thanks go out to Christian, James, and the delightful young lady at the bar who provided good conversation. I’ll be back.